3rd year is when young players often really break out. Agreed. Pidge is a jet. I reckon he is gunna explode this year. 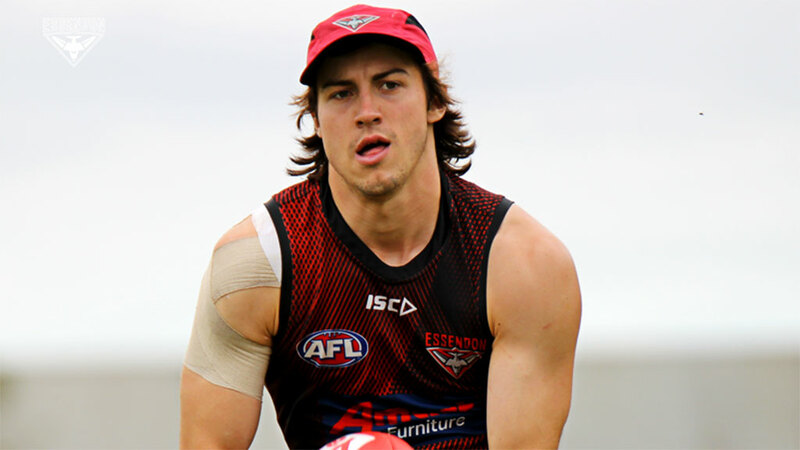 ANDREW McGrath is set to benefit from playing more midfield minutes, with his burst and sharp decision-making set to add an extra element to the club’s onball brigade in 2019. McGrath was a standout during the Bombers’ match simulation at Tullamarine on Friday, with his run and carry out of the middle of the ground often yielding deep forward entries for his side. Working alongside marquee recruit Dylan Shiel and a dynamic-looking Jake Stringer in the red team, McGrath won the ball in tight and utilised his pace out of congestion to advantage. McGrath has been regarded as a strong performer on the track this pre-season and told AFL.com.au in January that he was keen to improve his midfield craft after splitting his time between defence and onball in 2018. With skipper Dyson Heppell (hamstring tendinitis) watching on, Shiel did a bit of everything in his role – linking up with teammates for handball receives and using his evasive skills to juke away from the opposition. For people that attended training years ago, was Merrett tracking this well? Or any others from the past. He was so noticeable, the separation he was getting out of contests was spectacular. Very similar. And it was Merret’s 3rd season when he blew the ■■■■■■■ lid off. From the saga we got McGrath. Not worth the saga by any any ANY stretch. But we got something of immense value with McGrath. If he stays healthy he is going to be amongst our very best. But he only has 18 months to exceed GAJ. We got McGrath, then you could argue also as a result of saga we got francis, merrett, langford as well due to players leaving. Not a bad haul. You are right though, does not make up for what happened. Has he found any more penetration in his kicking this off-seaon? I didn’t see significant improvement. But I don’t know many players running at that speed kicking it any better. Either needs to hit the breaks in his last few steps or angle his body to get a better flight and or spin on the ball. That’s a very good point and worth remembering. One of Nino’s most considered posts? Zach was a standout the moment he walked through the clubs doors. I reckon it was even in his second pre season that he was already one of the best performers. Merrett was clearly better performed in his second season compared to McGrath. Had Merrett not injured his foot in the last month of the 2015 season then he could definitely have won the B&F that season. Doesn’t mean McGrath can’t make a similar jump to startdom this yeah though. The training reports suggesting he’s probably the main guy looking to step up. As apposed to Andy who won the rising star award and was a standout in the whole league? Merrett is my favourite player by the way. But to say McGrath isn’t tracking that well is silly. Before they become premiership captains, they’ll be premiership vice captains first.